“You wanted the very best whey protein isolate ever, we delivered! Natural flavors, natural sweeteners, and 100% (not just a grass blade here and there) Grass Fed, non-GMO, rGHb Free Grass Fed Whey. This isn’t just Whey Isolate, this is the highest quality, best tasting whey protein ever created. Have you purchased “Grass-Fed Whey”? You’ve probably been lied to! There’s a good chance the tub of grass-fed protein you’ve got sitting on the shelf isn’t all it's cracked up to be. See, the vast majority of proteins claiming to be grass-fed are most certainly grass-finished. Well, grass-fed cows must consume only grass, while grass-finished cows only eat a few blades of grass towards the end of their life. Dishonest companies market these grass-finished products as grass-fed, and the public is none the wiser. They get richer, while you’re left with a substandard protein powder. For this reason, and many others, MTS Nutrition All Natural Isolate uses ONLY whey protein from Grass Fed cows. That’s right, these cows have only consumed 100% grass, no exceptions. Each serving of MTS Nutrition All Natural Isolate is non-GMO and rbGH free Whey Protein Isolate, delivering 25g of 90% pure whey protein isolate (WPI), the highest grade of whey protein ever conceived. To further up the ante, MTS Nutrition has included only natural flavors and natural sweeteners to deliver a superior protein both in taste and quality. You’ll still get the same phenomenal flavoring that MTS Nutrition is known for along with the muscle-building benefits attributed to whey protein supplementation. These cows are NOT exclusively grass-fed. This negates many of the benefits associated with drinking whey from grass-fed cows. MTS Nutrition created a perfect, ALL-NATURAL, grass-fed whey. Natural flavors, natural sweeteners, and 100% (not just the occasional blade of grass) grass-fed, non-GMO, rGHb-free, grass-fed whey. Now let’s talk flavor. Even the fake grass-fed whey tastes awful! MTS Nutrition is known for having the best flavors in the industry, and this product is no exception. 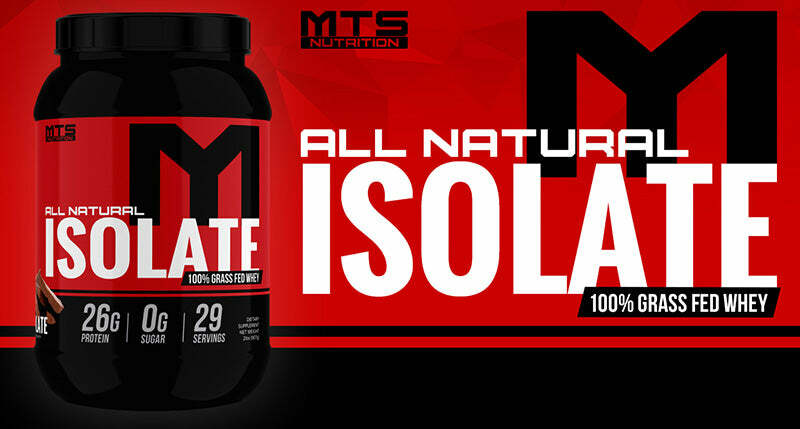 MTS Nutrition ISOLATE will have you craving more and more. It is delicious! Do what’s right for your health, and your results. Try MTS Nutrition Grass-Fed, All-Natural Whey ISOLATE today! Grass Fed rGHb Free and Non-GMO All Natural Whey Protein Isolate is the most pure form of whey protein you can possibly use. Whey protein isolate yields 90%+ protein, does NOT contain lactose and is perfect for those with digestive issues caused by dairy but still want the benefits of Whey Protein. Whey protein is known for having an extremely high biological value and is fast acting for use around the most strenuous workouts and is perfect for those looking for a protein supplement with controlled carbohydrate and fat. MTS Nutrition Grass Fed All Natural Whey Protein Isolate, you get all of these benefits with ZERO artificial colors or flavors! MTS Nutrition Grass Fed All Natural Whey Protein Isolate is perfect for use around training and is also a great protein source for your meals. Imagine replacing that bland chicken breast with a delicious milkshake—This is the protein for you! 1. Cribb PJ, Williams AD, Carey MF, Hayes A. The effect of whey isolate and resistance training on strength, body composition, and plasma glutamine. Int J Sport Nutr Exerc Metab. 2006;16(5):494-509. Depending on your individual protein needs, mix 1-3 scoops of All Natural Isolate into 6-18 ounces of cold water or milk (6oz per scoop) in a shaker or blender. For maximum and anytime you need extra protein in your diet. Produced in a facility that may produce Egg, Fish, Milk, Peanut, Shellfish, Soy, Wheat, Tree Nuts, Wheat. Do not use as a sole source of nutrition. Keep out of reach of children. INGREDIENTS:Grass Fed Non-GMO and rGHb Free Whey Protein Isolate, Cocoa Powder, Natural Flavor, Xanthan Gum, Ticaloid Powder, Stevia. Depending on your individual protein needs, mix 1-3 scoops of All Natural Isolate into 6-18 ounces of cold water or milk (6oz per scoop) in a shaker or blender. Contains Milk.Produced in a facility that may produce Egg, Fish, Milk, Peanut, Shellfish, Soy, Tree Nuts, Wheat.